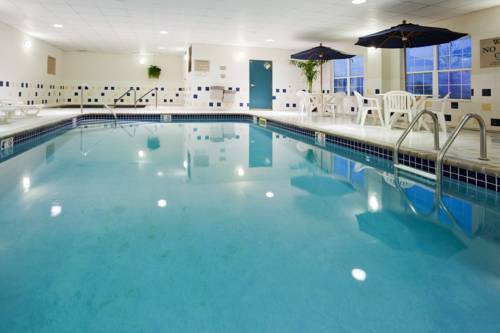 The Country Inn & Suites of Coralville is conviently located just off Interstate 80 exit 240. This location gives our guests prime access to the Coralridge Mall, Kinnick Stadium, and other Coralville/Iowa city locations. Our hotel offers a wide range of amenities including a complimentary hot Breakfast in a warm spacious dining area with over 25 items to choose from. We also feature an indoor pool and whirlpool, separate workout room, in-house laundry facilities,a relaxing beautiful lobby area with a cozy fireplace, and a business center for the on-the-go business traveler. We also offer free local calls and free high speed internet service throughout the hotel. After a peaceful night's rest, you can wake up to a fresh pot of in-room coffee and a complimentary USA today that is delivered to your door upon request. Hawkeye Room: Max Capacity 80 people. Theatre, Classroom, Conference or Round seating available.Free TV/DVD, High Speed Internet, Whiteboard, Screen,White tablecloths w/royal blue skirting. Flipcharts available at a cost. Break and Lunch service avail. on request.